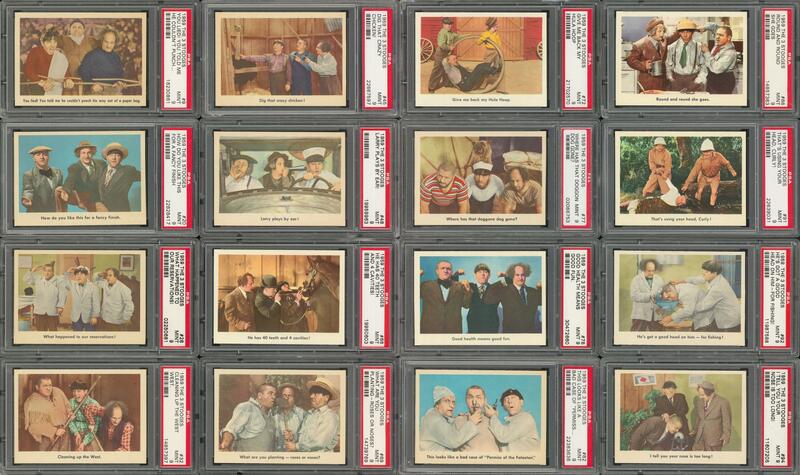 Lot Detail - 1959 Fleer "Three Stooges" PSA-Graded Near Set (93/96) Including Sixty-Seven PSA MINT 9 Examples! 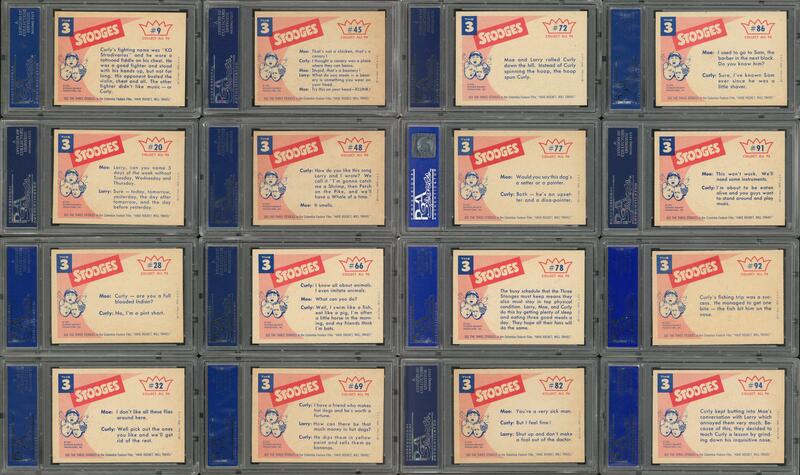 1959 Fleer "Three Stooges" PSA-Graded Near Set (93/96) Including Sixty-Seven PSA MINT 9 Examples! Each card has been graded NM-MT 8 or finer by PSA. Offered is a 93-card near set (missing #'s 1, 2 and 3 which are found elsewhere in the auction) of Fleer "Three Stooges" non-sports cards issued in 1959. 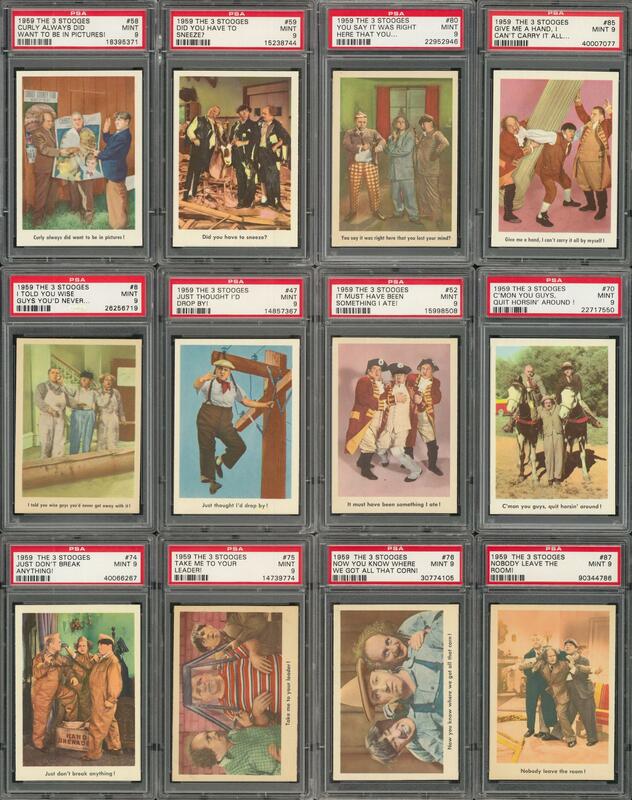 These color cards offer wacky scenes from the comedians' memorable television misadventures. 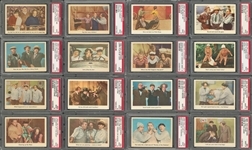 Captured in these distinctive Fleer designs, the expressions of Larry, Moe and Curly are delightfully entertaining and timeless. 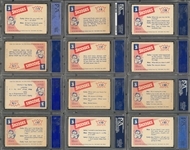 Hilarity is presented on every piece within the set, and the enjoyable nostalgia is enhanced by the condition of the cards. Each of the cards are printed on white cardstock. 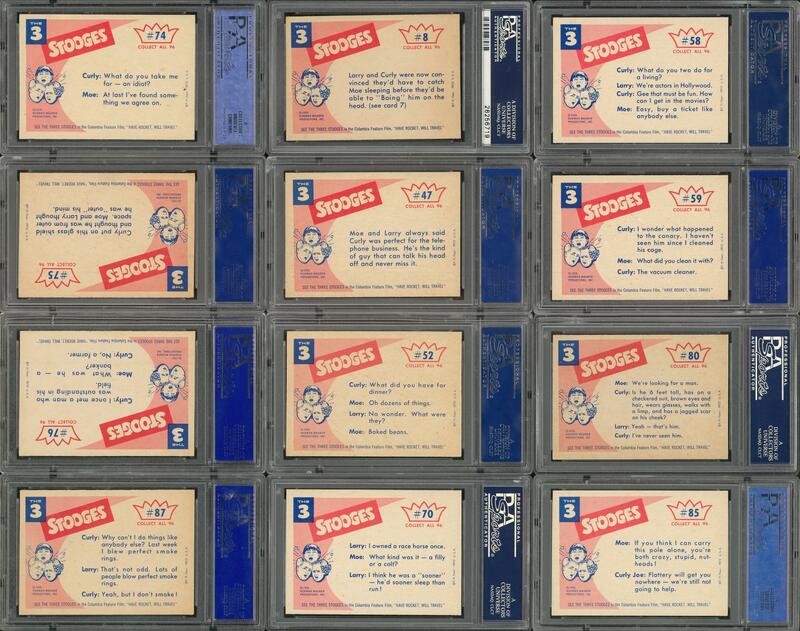 Includes: Graded PSA MINT 9: 67 cards; PSA NM-MT+ 8.5: 11 cards w/#'s 6, 14, 16, 22, 25, 27, 29, 34, 79, 89 and 96 "Trying the Squeeze Play"; PSA NM-MT 8: 15 cards w/#'s 5, 7, 12, 18, 31, 33, 35, 37, 41, 43, 63, 64, 65, 93 and 95. Near Mint to Mint to Mint condition throughout.